Barry Rudolph will teach you how to treat your home-studio, so you can create a listening environment you can trust and get your mixes to sound great across all playback systems. As mixers, we´re constantly on a quest to make the best sounding music possible. Some of us are steadily on the hunt for the latest and best plugins that replicate the sound of the classic analogue hardware we all love. That´s great! Most of today´s plugins are very well designed and can actually make a huge different in your mixes. But what matters more than anything else is having a good listening environment. You can´t mix what you can´t hear! If you don´t have a listening environment you can rely on, you won´t be able to make the right mixing decisions. – Not even with 500 k worth of analogue hardware. The importance of a good listening environment gets underestimated by a lot of young engineers and it´s one of the main problems a most home-studio owners are struggling with. You´ll know you´re having this issue if you´ve finished up on a mix and are happy with the results. You print it out and take your mix to the car or any other playback system. – Only to find that it sounds completely different from what you´ve heard in your studio. This can be very frustrating and confusing. Especially if you´ve worked hard on a mix for many hours, just to find that the final result is less than presentable. Luckily it´s not about you or your mixing skills. What you´ll need to solve this problem is a good listening environment: A well treated room and a good pair of speakers with an even frequency response. Now there´s bit of knowledge of acoustics and physics involved, if you want to treat your home-studio properly. So setting this up can present quite a challenge. 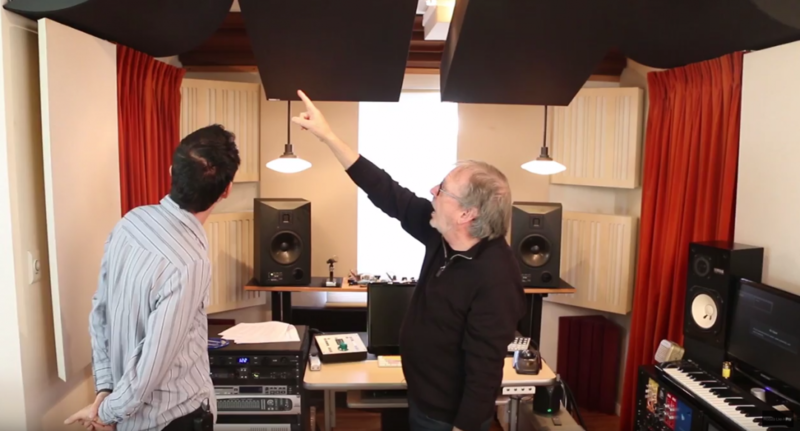 Barry Rudolph has been teaching home-studio design and acoustic treatment for several years. In the interview, I´m asking him all the questions you´ll need to know to be able to create a great listening environment for yourself, so you can make good mixing decisions and get your mixes to translate well across all playback systems. His explanations are easy to understand and actionable. Why small rooms have issues displaying low frequencies accurately and what you can do about it. What´s the ideal distance between your speakers ? What woofer sizes should you use with different room sizes? How much distance is needed between your speakers and the wall behind your speakers? To watch the complete interview and learn a whole lot more about treating your home-studio, please head over to Produce Like A Pro and Sign Up For The PLAP Academy 14 Day Free Trial. Special deals on microphones and plugins and more. Does that sound like something you might be interested in? Sign Up To The Academy Today! We´ll send you a reminder email when your trial is coming to an end, so you don´t have to worry about being forced into any kind of contract. But if you love the Academy and it´s helping your to improve your skills, of course you´re very welcome to stay for just $169 a year. If you have any questions about the academy or the free trial, please reach out to: support@producelikeapro.com. We´ll be happy to help!